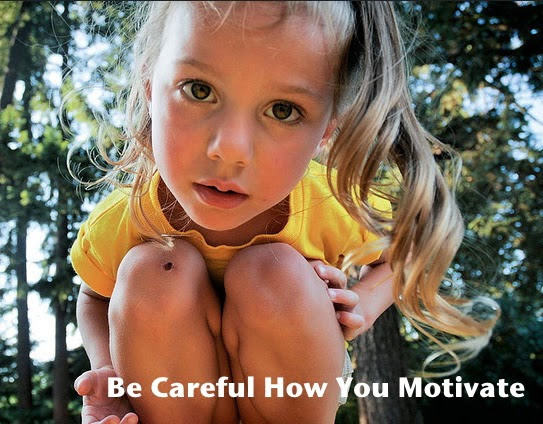 Be careful how you motivate. While there are those who point to Matthew 5 as a way of motivating each other to be salt and light in this world, remember: Jesus did not tell us to TRY to be salt and light in this world, He said that we ARE salt and light. In view of the New Covenant, telling people to TRY to be what Jesus thinks they already ARE might well imply that Jesus failed to actually make the change He intended to make, and that people need to become rather than to believe, to change rather than to embrace, to work at it rather than to rest in it. That is not Christian. Through faith in Christ’s cross and resurrection, you have already been made holy (you’re not going to get holier), you have already been made righteous (you’re not going to get righteouser), you have already been made perfect with Him (you’re not going to get perfecter). You’ve been made clean and close, fit with Him forever, just as He intended. Before you go to heaven, there will be no last minute modifications, no bit of re-tooling or re-engineering, and no final scrubbing, because you’re fit for heaven now. You’re heaven ready. And salt and light? You already preserve and display the handiwork of God, you already add invaluable flavor to a world in need of it, and you already are a beacon of God’s grace in an otherwise dark and frustrated world. He did it. The cross and the resurrection actually worked. Believing that, and believing it again and again, will provide motivation enough. (For your kids, too.) You ARE salt. You ARE light. To appease the world's needs of our humility, the Christian has simultaneously called themselves both Saint and sinner. This is the dual nature lie that the world accepts for Christians and is perpetuated by religion. A spiritual schizophrenic Christianity is not a healthy one, not in the soul especially. Jesus said that a house divided against itself cannot stand. Romans Ch 6 makes it clear that our old sinner self, our old adamic sin nature, was crucified at the cross. God no longer counts our sinful behavior as part of our identity anymore than he counts the temptations which wage against us in our thoughts as our identity either! The power of sin in the members of our bodies is a clever imposter, always trying to fool us into believing we are the very sin we think about or commit from time to time. If that were so, then the cross did not work and we are back to square one trying to put away sinful behaviors by the power of our religious self effort.
" and now having been made free from sin you derive your benefit, resulting in sanctification, and the outcome eternal life. For the wages of sin is death but the free gift of God is eternal life in Jesus Christ Our Lord." "... for by one offering he has perfected those who are sanctified." Make no mistake, behavior is a big part of the Christian experience. But it is never on the shoulders of those whose identity is squarely in Jesus Christ and in his crucifixion, burial and Resurrection. Because it was in that finished complete work that we too also were crucified buried and raised to New Life! Christ is our very life, and no behavioral modification program can change that. From my addition on FB this month. Just imagine taking God at His word, and believing you are "qualified" to share in the heavenly inheritance ... what a concept! ... Giving thanks to the Father, who has qualified us to share in the inheritance of the saints in Light. Got 2 minutes? If you’re experiencing disillusionment and doubt, here’s a quick and encouraging, true pick-me-up. Watch for the visitor toward the end. If you ever fall prey to thinking that you’ve got to get yourself together in order to receive something from God (as I sometimes do), then this video is for you. Give 6.5 minutes to find out what God likes and why that makes life a lot easier and better for you. We are not disobedient due to lack of commitment, but because our determination to obey is rooted in the same flesh that drives disobedience. True obedience is a function of submission and trust, not commitment and perseverance. We follow Him and let Him produce through us instead of striving and fretting to produce for Him. Which is to say, true obedience is rest. Take the time to read this short one from John Lynch. This account/testimony is similar to my own journey with Jesus, and I am forever grateful for His Life in mine What grace and victory!! Enjoy, and may the truth set free. “This one snuck up on me. The discovery that this new life in me wants to do right. I’m not a bad person who believes in a good God. I’m a new person now fused with God. And that new me wants to obey this God from this new heart of love. For years I feared that wouldn’t be enough. I was still carrying enough dark and erratic thoughts to convince me that my heart could not be trusted. I bought that lie all through seminary and into the first few years of preaching. I loved God, and probably thought that meant I shouldn’t trust me if I wanted to be pleasing to him. I, like millions of others, thought that statement in the Old Testament about my heart being wicked and not trustworthy was true about me. It’s not. Not at all. The result of the Cross and Resurrection were this powerful: I have a good and noble and trustworthy heart, and I am maturing into these new clothes! Not only do I not want to do the bad, I also want to do the right. In the past, with that dead, moralistic theology of shame, I never gave myself a chance to hunger or thirst. I always supplied some artificial band-aid to get me back, even though my heart had not been given a chance to respond from its new life. It was devastating to discover my own safeguards and techniques were actually keeping me from getting a chance to do right. I’m not sure there is a more life-giving revelation for a believer than discovering I actually want to live for Christ, instead of secretly imagining I must resent myself for not wanting to. As long as you see you as a bad person trusting a good God you will surround yourself with teachers and writers who will compel you to promise, care more, care more about caring more, sell out, give it all up, blah, blah, blah. The religious church hasn't gotten off the bad heart bandwagon, a revelation of the New creation is a must! “I love how God’s work gently unfolds in our lives... I’ve come to trust it over my own plotting and scheming. I know the frustration of asking God to give me wisdom about something I wanted to do, and then feel as if he’s gone silent. Looking back, I now see that I was asking God to give me a strategy SO I COULD WORK TOWARD THE OUTCOME I DESIRED. God didn’t go silent; he just didn’t have an answer for that. So, when he didn’t say what I wanted to hear, it was easy to make up a process in my own head and attach HIS name to it. That is a futile road, for sure! When he didn’t honor my process, I felt even more abandoned. But NOW, I’ve been won in to different space, knowing that God’s will for us unfolds in the circumstances of life. HE wants a relationship where HE will walk with us. I’m convinced that the BEST way for God NOT to get me where HE wants me in six months, IS TO TELL ME! I’ll actually try to get there FOR HIM and mess it all up. But IF I’ll just follow Him today, and again tomorrow, six months from now I’ll be right where He wants me to be. Almost everything I’m involved in now was not part of my planning, but I wouldn’t trade how God has fulfilled the passions HE put in me for anything I’d envisioned in the past. free to respond to the opportunities that come, RATHER than trying to claw my way to the destination I DESIRE. The invitation was to an adventure with him down the road less traveled, RATHER THAN a new methodology to try and create HIS Church in OUR image. I meet TOO MANY young people who are trying to strategize a new way of doing ministry. It’s an EXHAUSTING road with LITTLE real kingdom fruit. I encourage them to draw close to the Master and LET HIM guide them through the circumstances that COME THEIR WAY. Rather than trying to impose OUR will, we get to FLOW WITH HIS, as it winds through the circumstances and opportunities of life. Then we’ll find ourselves BEING FRUITFUL IN WAYS WE’D NEVER IMAGINED AND OPEN DOORS WE COULD NEVER HAVE CONTRIVED. It’s slower this way, to be sure, but it is a MORE JOYFUL AND FRUITFUL way to live! Someone said "God is much less interested with you trying to love Him than allowing Him to love you." ... I think he is correct. Safe, secure, hidden, sealed, and untouchable. This is how the Bible describes our relationship with God. We are safe in His hand, and nothing can take us away. We are secure in His grace, nothing can separate us. We are sealed by His Spirit, nothing can remove us from His presence. And we cannot be touched by the evil one. 2 Cor. 5:21 "For our sake he made him to be sin who knew no sin, so that in him we might become the righteousness of God." Many believers struggle to accept the fact that they are as righteous as God is righteous. They'll agree that it is positional, but not actual. Well, in the verse above, was Jesus only positionally "made to be sin"? I think most believers would say "of course not! He became sin for us, he took our sins on himself!!" If Jesus literally, actually, really became sin for us then wouldn't the righteousness of God we become when we receive him be literal, actual, and real?